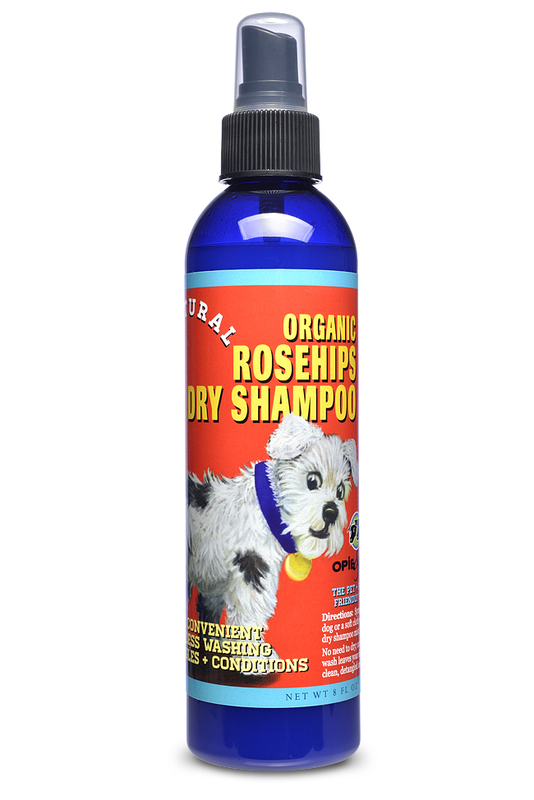 Organic Rosehips Dry Shampoo - 8oz. Opie & Dixie don't always need a full-on scrub in the tub. Sometimes a swift, waterless wash-and-wipe does the trick!. Purified Rain/Glacier Water, Herbal Blend of *Rosehips, *Chamomile, *Calendula Flowers, *Burdock, *Safflower Oil, *Grape Seed Extract, *Rosemary, Biodynamic Avocado Oil, Biodynamic Macadamia Oil, *Lavender, *Lotus Bean gum, Australian Bush Extracts of Kakadu Plum; *(Vegetable) Glycerine, *Burdock Root Extract, *Aloe Vera Extract, *Jojoba Oil, Henna Extract, *Lavender Oil, *Pennyroyal Oil, *Tea Tree Oil, Citrus Seed Extract, Natural Grain Alcohol, *Rosemary Oil, *Rose Hip Seed Oil, Canadian Wild Crafted Red Clover. Shake the bottle, mist your pup's coat or a soft, dry cloth, massage all over and – voila! What a refreshing treat! Organic Kitty Shampoo - 8oz. Organic Ear Wash - 4oz. Organic Herbal Creme Rinse - 8oz. Organic Oatmeal & Almond Shampoo - 8oz.